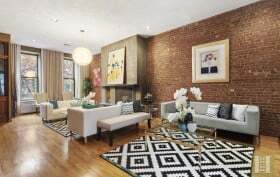 In September, 6sqft uncovered the listing for 136 West 130th Street, the brownstone owned by Emmy-nominated “All My Children” regular and current “Entertainment Tonight” correspondent Cameron Mathison and his wife, Vanessa. The couple bought the four-bedroom home for $1.2 million in 2004 after house hunting and falling in love with Harlem‘s “Sesame Street” vibe. It had already been through a substantial developer-led renovation, but Mathison finished up the job, creating an urban oasis that’s a mix of classic charm and contemporary fixes. Though the Canadian actor told the Times in 2009 that he “envisioned being in this place forever,” the plans changed when the TV show moved studios to Los Angeles. That same year, the couple listed the four-story home for $2.7 million, followed by a price cut to $2.5 million in 2011. There were no takers, so they rented the property out for $6,900 a month, before re-listing it this past fall for $2.9 million. Despite moving back to NYC, Luxury Listings NYC reports that the soap opera heartthrob has now sold the residence for $3.3 million, pretty significantly over ask. There’s something compelling about a great-looking home without a superlative in sight, neither painstakingly restored to historic glory, cutting-edge contemporary or irresistibly luxurious. And for a busy city family, kid-friendly good looks and low-maintenance comfort go a long way. This 4,000-square-foot Harlem brownstone at 136 West 130th Street fit the bill and then some when Emmy-nominated “All My Children” regular (and more recently talk show correspondent and reality TV host) Cameron Mathison and his wife, Vanessa, happened upon it in 2004, and subsequently purchased it for $1.2 million. The couple had ventured into Harlem when apartment hunting (with a new baby) and fallen for the neighborhood’s “Sesame Street” vibe. A developer had done most of the renovation work, and they added the finishing touches. Interviewed in the Times in 2009, the actor explains that the couple had “envisioned being in this place forever;” that plan changed when the TV show moved studios to Los Angeles. Mathison listed the turn-key renovated home for $2.7 million and headed west. There weren’t any takers at the time, and the four-story townhouse is back, asking $2.9 million–albeit in a very different market, especially in Central Harlem, than that of 2009.